touring Scotland, the UK and internationally, including Ireland, Germany, Sweden, Poland, Ukraine, Australia and most recently the USA and Denmark. 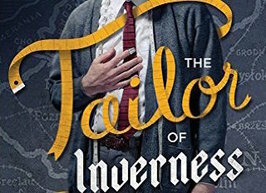 ​We are currently setting up our forthcoming spring tour with Matthew Zajac's phenomenal international hit The Tailor of Inverness, directed by Ben Harrison. This will be the show's 6th Scottish tour, the first for 3 years. The show has played to audiences across the world, winning awards and plaudits wherever it has been seen. We're also preparing our next new production, Kevin MacNeil's adaptation of his brilliant novel The Stornoway Way. The show will be developed in March at An Lanntair, Stornoway and will open there in late August prior to a Scottish Tour in October. The show will feature special composed music by Pippa Murphy and songs in Gaelic and English, including Local Man Ruins Everything by Kevin and Willie Campbell from their album Visible From Space. You can listen to it below. 2018 Dogstar produced and toured Scotland and Sweden in 2018 with Morna Pearson's punk climate change comedy Let's Inherit The Earth, co-produced with Sweden's Profilteatern. We also presented Mungo Park - Travels in the Interior of Africa in the Netherlands as part of the 2018 Leeuwarden European Capital of Culture events in September with our Danish co-producing partners Mungo Park Theatre. Dogstar is a European touring theatre company based in the Scottish Highlands around Inverness, one of Europe’s fastest growing small cities. We commission, produce and tour new plays by writers from the north of Scotland and elsewhere. We aim to present our varied audiences with engaging and entertaining theatre which combines the new and the traditional, the classical and the experimental, drawing on accumulated experience and contemporary innovation. ​From its early Highland tours, the company has extended its reach, now touring across the UK and internationally, with over 170 performances outside Scotland since 2009. These include work presented at Copenhagen Stage Festival Denmark, Umea 2014 European Capital of Culture Sweden, Konfrontacje Teatralne Lublin Poland, Ivan Franko National Theatre Kyiv Ukraine, Les Kurbas Theatre Lviv Ukraine, Malmo Stadsteater Sweden, Brits Off Broadway New York USA, Adelaide Fringe Festival Australia, Societaetstheater Dresden Germany, English Theatre Berlin Germany, Pavilion Theatre Dun Laoighaire Ireland, Clwyd Teatr Cymru Wales, Birmingham Rep England, and Mungo Park AC Denmark. Dogstar continues to tour to village halls in the Scottish Highlands and Islands as well as to city centre theatres. Much of our work springs directly from the Highlands’ defining characteristics: a stunningly beautiful and harsh natural landscape; a tumultuous and marginalised history; a shifting and changing population; a vibrant oral and musical tradition. Our productions speak to our audiences using some of Scotland’s best actors, musicians, writers, directors and designers, collaborating with international artists and partners. For us, theatre is a place for debate and celebration, for ideas and entertainment, for a few laughs, a few tears, a challenge to the mind and a memorable night out. At its heart, its about communication between the actor and the audience. It can’t exist without you.